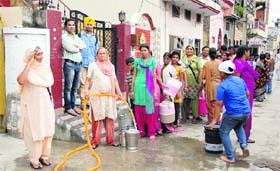 Jalandhar is the most affected district in the entire state by the thunderstorm that came on Sunday. Work in almost all the offices got disrupted due to complete power failure in the city. Even as the names of 25 members of the District Grievances Committee have been almost finalised, the district administration is sitting on the file and has not moved it to the Home Secretary for a final clearance. 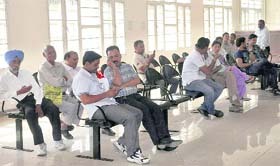 The applicants at the newly opened Sub-Registrar office were a harassed lot as electricity supply remained off since morning and the systems could not work in the absence of any power backup. The Congress today said it was a matter of shame for the Punjab government as road accidents were unabatedly on the rise in the state. The health authorities claim to have completed 78 per cent of the target by administering polio vaccine to 48,685 children up to five years of age in the district on the second day of the Migrant Pulse Polio drive today. The Kapurthala district administration has spent a grant of Rs 41.45 crore from the Sarv Shiksha Abhiyan scheme on construction of school buildings, training teachers, providing facilities to special students, midday meals and renovation work in 566 primary and 264 upper primary schools of district. With the famous Sodal Mela beginning on Wednesday, thousands of devotees have already started thronging the temple to pay obeisance for the past four days. 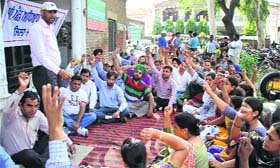 Members of the B.Ed Teachers' Front, Jalandhar, today staged a dharna outside the office of the District Education Office (Secondary) in protest against the non-acceptance of their “long-pending” demands. A 28-year-old man committed suicide at his house in Mohalla Dabbipura, near Basti Gujan, this morning by hanging himself from a ceiling fan. Inspector-General of Police, Zone-II, Paramraj Singh today convened a meeting of DIGs and SSPs falling in his range directing them to be more vigilant in view of the forthcoming festive season. Punjabi film Young Malang is all set to release on September 20. The star cast of the film was here in the city on Monday for the promotion of the film before its release. Computer tablets were distributed to the MBA and MCA students at KCL Institute of Management and Technology. The institute management said technology has the potential to transform education by extending the learning space beyond the four walls of a classroom. The tablets were distributed during an event “TECH-VIZ" held on the campus. 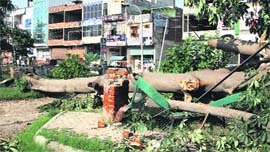 Jalandhar is the most affected district in the entire state by the thunderstorm that came on Sunday. 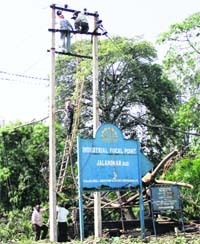 Work in almost all the offices got disrupted due to complete power failure in the city. Traffic was disrupted at most of the places due to the uprooting of trees. Many schools declared holiday today. 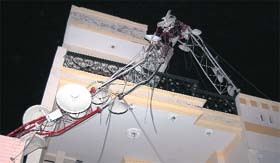 A lot of damage to property was reported in various parts of the city. The most affected were the mobile and ATM services. “According to reports we have received so far, Jalandhar is the most affected district in the entire state by the Sunday thunderstorm. Maximum damage to property, environment and services are so far reported here only till Monday evening,” said Dr Sharad Satya Chauhan, Inspector-General, Traffic Police, Punjab. Transportation was also affected in the city due to the thunderstorm. At most of the places traffic jams were witnessed due to the uprooting of trees and falling of walls and buildings in and around the major roads in the entire district. Maximum damage has been reported from rural areas. Due to the long power failure, the first service to come down in the city was the communication, like the servers and mobile phones. Due to server failure, work in most of the offices, like hospitals and banks, got affected. Long queues were seen in various banks and outside ATMs. “I have visited more than seven ATMs in the last one hour, but none of them is working,” said Puja Gulati from Model Town. Although a few banks with alternate servers were functioning, but the services in the banks relying on single server came to a complete halt. 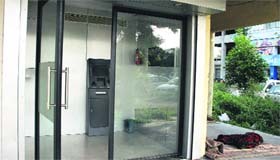 “We did not face much problem in the branches as we had adequate power backup in place for them, but some of our ATMs, which are in open area or rely completely on servers, went off for sometime due to power failure on account of falling of trees. We have a power backup, but we cannot do anything if the server is down,“ said OP Mehra, Chief Manager, State Bank of India, Jalandhar. Mobile services were the next to get affected. Again, due to power failure, most of the mobile towers stopped working in the afternoon. People faced a lot of problem like call dropping and unclear voice on their phones between 2 to 6 pm in the entire district. Some people were not able to dial emergency numbers also from their mobile phones. However, by evening some towers were made operational with the help of generator sets. “All the mobile towers run on commercial supply. We have power backup for them, but during long power cuts, we have to use generators after the backup get exhausted. But in some rarest-of-the-rare case, like this one, when power supply does not resume for long, even the generators go off due to overheating, so the communication services get interrupted. The efficiency of our services relies mainly on consistent power supply,” said Sanjeev Kumar Nigam, Senior General Manager, BSNL, Jalandhar. Cinemas lovers also faced difficulties while watch new releases on weekends. The theatres inside the malls were functioning normally due to the consistent power backup provided by the malls, but some interruptions were seen at Sarb Multiplex. “There was no power supply till 6.30 pm. We have been running uninterrupted shows since Sunday on our power backup only. Later, the supply with very high voltage was resumed. We cannot use this power as it can damage our machines,” said RB Sharma, Senior Manager, Sarb Multiplex. “Power grid failed completely due to high-velocity winds. Our transmission lines also got damaged and many transformers developed technical snags. The fault was very big like the thunderstorm itself and will take some time to be rectified. However, we have restored services at most of the places and will be finishing the restoration work soon,” said spokesperson for Punjab State Power Corporation Limited. Train services were also got disrupted on Monday. Many trains were stationed at the Tangra railway station for hours. One line was damaged in the yard of the Cantonment railway station due to uprooting of an old tree. Many sheds of the General Railway Police were damaged in the thunderstorm. Also, unconfirmed reports of some loss of life due to the thunderstorm were also received from some areas. While all other districts have already formed their committees and have even been holding meetings, Jalandhar lags far behind on this front. It has been seven months since the name of Health Minister Madan Mohan Mittal was announced for chairing the committee meetings in Jalandhar, still there has been no headway. While Deputy Commissioner Shruti Singh has been transferred, the new DC Varun Roojam is on leave. He is likely to join office after Wednesday. The list of other members on the panel includes top administrators of the district - DC, SSP, MC Commissioner and Assistant Commissioner (Grievances), who is also the member secretary. The names of one representative each from among freedom fighters, ex-servicemen, BC, SC, woman wing, youth wing, Bazigar or Rai Sikh, Muslim, Christians, one representative of NGO, business or agricultural community, numberdar, activist of the Bhartiya Kisan Union, NRI, Balmiki or Mazhbi Sikh and one opinion leader picked by the DC have also been recommended for approval. Even as the guidelines stipulate that the committee has to meet once in a month, it has been almost four years since there was any meeting of the committee meant for redressal of public grievances. The last meeting was chaired by Deputy Chief Minister Sukhbir Singh Badal after he had assumed the charge as Chairman of the Jalandhar and Bathinda committees on October 23, 2009. Prior to him, Capt Kanwaljit Singh was the chairman of the committee, but he passed away in March, 2009. Assistant Commissioner (Grievances) and GA to DC Dr Sanjeev Sharma confirmed that the consent of the DC was pending. While the staff kept on issuing tokens to the applicants from morning, no work could be done since the entire process of registration, clicking of pictures and other work is done digitally. Resultantly, the applicants in the offices of Sub-Registrar-I and II were asked to wait till the power supply got restored. Gulshan Kumar, a resident of the 120-Feet road, said he came for getting a property registered at 9 am. "I have been waiting here for four hours now, but to no avail. We have been told that as soon as electricity connection gets restored, the work will be done. It is such a splendid office building, but I am surprised that over 70 persons have been made to wait for so long just because there has been no power backup. It is completely ridiculous," he fumed. It was around 1.30 pm that the officials managed to get a generator set. But it restored supply only to the office of Sub-Registrar-I, while those waiting at the office of Sub-Registrar-II still got no respite. Tehsildar-II Amanpal Singh said he was helpless as there was no power supply. "I have told the mechanics to link up this side of the office as well with the generator," he said. Punjab Pradesh Congress Committee (PPCC) spokesperson Sukhpal Singh Khaira said around 5,000 deaths were reported in Punjab due to road accidents every year. Citing the incident of fatal accident on the Chandigarh-Nawanshahar road on Saturday in which five persons from Nakodar died, Khaira said the Punjab government had deputed only 1,820 traffic police personnel in the entire state, while there are 4,120 security personnel to guard as many as 1,294 VIPs. "This is not only a cruel joke with the people but it amounts to rubbing salt on the wounds of those affected by road accidents," he said. 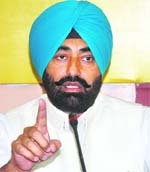 About 10 to 15 precious lives are lost everyday on the roads in the state due to road accidents, Khaira claimed. "In March this year, 13 schoolchildren were killed on the spot near Nakodar when a truck rammed head on into a school van. Protests were held by the parents of the children and the concerned citizens of the area which forced the Transport Minister to order a judicial inquiry into the accident. But it was only to be trashed in a dustbin," Khaira alleged. The Congress spokesperson said the number of preventable deaths due to road accidents has been on the rise in the past years. Unfortunately enough, nothing has been done to rectify the grossly erroneous road traffic management in Punjab, he added. "Let the VIPs of Punjab shed their personal security guards so that they can be deployed for the safety of ordinary people. We also need to amend our laws, including the Section 304 of the IPC (death due to negligent driving), are ineffective,” said the Punjab Pradesh Congress Committee. A press release issued by the Civil Surgeon's office here informed that different teams of the Health Department in a door-to-door campaign today administered polio vaccine to 39,337 children in urban areas while 9,348 kids were vaccinated in rural areas. Those left would be covered by the health teams tomorrow. The district health authorities had vaccinated 55,304 children on the first day of the Migrant Pulse Polio drive launched on Sunday. The department has been focusing on the children of migrants besides labourers working at brick kilns, industries and other sectors across Jalandhar district. Deputy Commissioner DS Mangat said Rs 25.03 crore was spent on civil works in government schools with which 45 new classrooms and 49 offices of headmasters were built. He said an amount of Rs 1.53 crore was spent on renovation works of buildings of government schools. Mangat said Rs 5.96 crore was spent on providing salaries to teachers in schools under the Sarv Shiksha Abhiyan where there was shortage of teachers. Rs 2.22 crore was given to education providers as honorarium. The DC said that training programmes were also arranged for teachers to make them aware of new techniques of teaching for which Rs 34.77 lakh had been spent. Mangat said 67 wheelchairs, 17 tricycles and other assisting tools were provided to special students as per their requirements prescribed by the doctors and eight students were operated upon for heart ailments. He added that physiotherapy services were given to 467 students. The DC said 205 children were admitted to schools after special training in 2012-13. He said school uniforms, stationery, books and sport kits were provided to these children. The Baba Sodal Mandir Talab Kar Sewa Committee will formally offer prayers at the shrine and perform havana yajna on Tuesday. 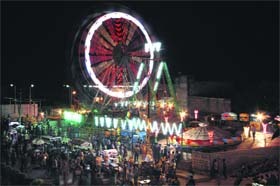 The mela will formally start with the hoisting of religious flag on Tuesday itself at 5 pm. A Jagran will also be held in the Sodal Talab. Chief Parliamentary Secretary for Cooperation Krishan Dev Bhandari, former minister Avtar Henry and other dignitaries will be present on the occasion. Meanwhile, elaborate security arrangements were made to maintain law and order during the mela as several lakh devotees would come from various parts of the state to pay obeisance at the temple. Over 1,000 security personnel would remain deployed round-the-clock to check incidents of pick-pocketing and eve-teasing during the mela, sources said. Several religious organisations will also organize langars en route to the Sodal temple on Tuesday and Wednesday. Special arrangements have been made to provide uninterrupted power supply in and around the temple. Medical teams have also been deployed to tackle any emergency case during the mela. Holiday has been declared in all government offices, boards and education institutions on Wednesday in view of the mela. This Sodal Mela is held to mark the death anniversary of child deity Sodal. The fair is held on the day the child is said to have received his communion with God. Observed on the 14th of Shukal Paksh in the month of Bhadon, which coincides with the month of September in the English calendar, Baba Sodal Mela is one of the most popular festivals celebrated in Jalandhar. Legend has it that Sodal, a member of the Chadha clan of Khatri caste, who reside in the city of Jalandhar, sacrificed his life by drowning himself in pond. It is believed that the child had divine powers. The samadh of the child deity is the sanctum sanctorum. Beside the samadh stands the portrait of the deity embellished with flower garlands and rosaries. Prayers are offered here by the pilgrims. Wading through the waters of the Baba Sodal-Da-Sarowar situated beside the samadh and taking a dip in its water forms a part of the ritual for the pilgrims. Addressing the protesters, front president Ravinder Singh said the state government was hell bent upon destablising the Education Department by formulating wrong policies. He expressed dismay over the delay in the disbursal of salaries of the teachers. "The teachers who were regularised by the government in April 2011 are yet to get the confirmation letter and seniority number. In case, the demands of the front are not met with soon, we will resort to a massive agitation," warned Ravinder, adding that the front is organising a state-level rally in Jalandhar on October 6. The deceased, Davinder, alias Kaka, was married and had a four-year-old son. He was working as a small-time agent assisting applicants with typing work in the tehsil complex. This morning his wife Preeti had gone to a neighbour’s house when he committed suicide. The Basti Bawa Khel police said the family suspected no foul play and said he was under depression. “Young Malang is a story of six friends who despite having different backgrounds are tied by a strong bond of friendship. It is a nostalgic journey of bonding and falling in love while facing the ups and down in their relationship,” said Sidhu. Yuvraj Hans, son of Punjabi singer Hans Raj Hans, who debuted with Yaar Annmulle followed by Buurraahh in 2012 had Bollywood beauty Anjana Sukhani paired opposite him. Accompanying them are model-turned-actress Neetu Singh, Anita Kaliey and singer-turned-actor Balli Riar and Vinaypal Buttar. Adding the oomph quotient to the film is Pakistani bombshell Mathira in an item song. Also seen are comedian Chacha Raunki Ram, Balwinder Bicky, Miss Malaysia Leena Sidhu. Hulky Aryajit is in the negative lead while legendary actors Yograj Singh, Kiran Kumar, Tej Sapru, Harpal Singh, Sunita Dheer, Seema Kaushal are also there. The songs of the films are rendered by singers Mika, Javed Ali, Shafqat Amanat Ali, Sonu Kakkar, J Riaz besides Yuvraj Hans, Balli Riar and Vinaypal Buttar. Young Malang also introduces the trio of Raptiles 101, a Punjabi rappers’ group that appeared in the Indian Idol. The film is directed by Rajdeep Singh while director of photography is Anshul Chobey. Director of fashion is Neha Sidhu and the screenplay is by Manshendra Kailey and Rajdeep Singh. Department of Zoology, DAV College, organised “Eco-Quiz” and poster presentation competition. The function was presided over by Vice-Principal PK Kapoor and Head of Department of Zoology Karoona. While addressing to the audience and participants, Karoona emphasised on the fact that the event was an initiative to make students aware about environmental issues and that the outcome of the quiz will not be judged by how graceful the quiz would be but how much knowledge the students will acquire from the quiz. The top four teams for quiz were selected after the written test.